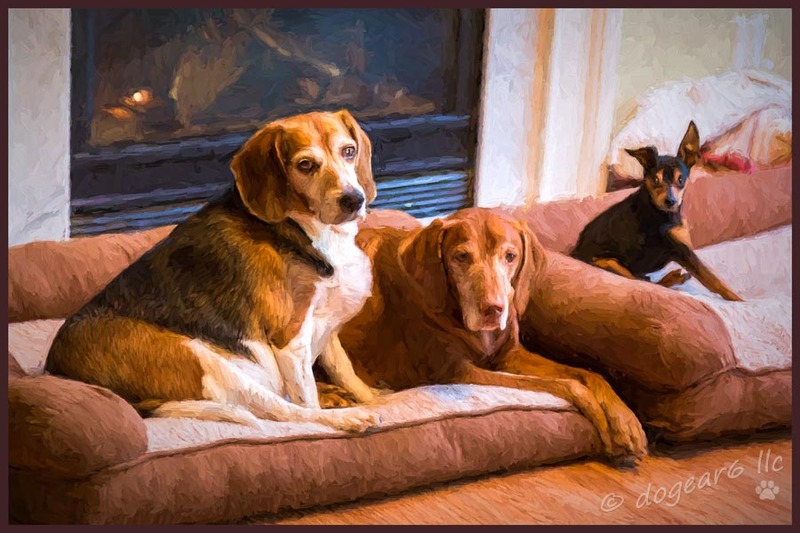 The beagle, Vizsla and miniature pinscher. Do you have a treat? This week’s photo challenge is new – something new for me in 2015 (to see how other photographers interpret it, click here). Oh the joys of photographing pets! As I settle into unemployment and looking for a new job, I’m developing new routines. I haven’t written about routines for a while (see my last post here). What I like about routines is the structure it gives to a day and how the many small decisions that are needed don’t have to take up much mental space. At the same time, routines need adjustment to keep them useful. So along with job searching, what else is new in my routine? Yoga Each Morning – I’ve never done real well with doing some yoga or stretching each day. Since something is better than nothing, I’m instead doing ten minutes of yoga each morning before I get dressed. One of the things I learned from Peggy Cappy’s DVD, “Yoga for the Rest of Us” was how to do a sun salutation without getting all the way down on the floor. So I do some shoulder work, stretch my torso and back, then do two sun salutations. If I have time, I do more leg work or get down on the floor. If I don’t, that’s good enough. Incidentally, her DVD is excellent for anyone with mobility issues or who is new to yoga and can’t keep up with a class. It’s a good workout and not as easy as it sounds. Long Lingering Breakfasts – My favorite boy toy and I have always enjoyed going out for breakfast before I go to work. The last few years, we’ve gone nearly every morning due to my long hours. The nice thing about breakfast is we’re both fresh and in a good mood. We get a lot done during breakfast, discussing all kinds of topics in addition to just visiting. Now that I don’t have to hurry off to work, those breakfasts have gone from 30 minutes to between 60 and 90 minutes. It’s been fun and we’re enjoying just spending time together. Walking The Dogs – The dogs are getting a lot less sleep these days! They’re hovering continuously to make sure I don’t leave the house without them. I walk the beagle and Vizsla separately (the miniature pinscher does not get walked – he’s too afraid and doesn’t like it). I have to sneak them out one at a time, which is challenging. Some days I take the Vizsla to the local park and if I can, leave him off-leash to run. The beagle can’t walk very far due to his back, so when I get home, he goes for a small stroll around the neighborhood. Afternoon Nap – This is so nice! It doesn’t have to be long to refresh me for the evening. I just enjoy snoozing in the easy chair for a short while before supper and am much more alert after supper. My days are full! By the time I make my phone calls, take care of E-mails and fill out whatever paperwork is due now, I’m not having much time left for my photography or to even read. I think this will start to settle down, but we’ll see. In the meantime, these new things in my life are enjoyable. I will miss them when I go back to work. The dogs appear to get along so well. I love that you can let the Vizsla go for a good run occasionally. The beagle and the Vizsla really love each other. They don’t like the min pin though, which is why he’s alone in one big bed and they’re both in the other one. The min pin has his own bed and some nights we make him go in it so the big dogs can each have their own bed! I need to video the Vizsla doing his big loopy runs. He’s so pretty when he does, but he’s really fast too. A routine is always good. I like how you included some valuable time with hubby, the dogs and for you! I love quick power naps as well. We need to get into a routine as well here in Spain as I feel at loose ends without one. Enjoy this time! You’re having the same problem that I’m having – life’s had a big change – how do you adjust to it??? I’m glad you liked the post and let me know what you liked. I hadn’t thought of it that way, but it was pretty balanced, wasn’t it. I totally agree with you on that! I think housework and raising children is way under-appreciated. All those cute pix–uncooperative bunch! LOL It’s amazing you got the shot of them all looking at you before they took off. I’m glad you’re enjoying your days and new routine. Thank Patti. I’m enjoying the routine, but wish I had more time than the job search is allowing. And yes, the dogs are about as uncooperative as the kids. Of course, my husband using the “treat” word is why they came running so quickly. I was using natural light at 3200 ISO, so there was no way I got anything more than a blur! Love the pictures of the dogs taking off from their original “pose.” Real life at its finest. So glad to see that you are taking real life and truly savoring it. The idea of a long, bonding breakfast almost every morning sounds absolutely fantastic–must be the best way to start the day on a positive note. Breakfast every morning has been great. My husband wants to cut it back (money and calories), but I think we do a lot of good sharing and visiting, so I’ve been reluctant to do so. Yeah, the dogs do keep me humble. When I wrote the post, I intended to just share the final photo. Then I realized I had a great opportunity to make everyone laugh. I was glad I hadn’t deleted the bloopers! Thanks Tina, as always!! I’m trying to enjoy my time off, but this job search stuff is really taking up a lot of time. I keep thinking it will slow down, but it hasn’t yet. Thanks Gale! I do the same with cooking and errands as you do. I cook my proteins once a month and freeze them. It’s so much easier to just cook and debone two chickens, four pork tenderloins, and make several pots of soup all at one time for the month. Thanks also for the link – I enjoyed reading about your word. My honest sharing took a while to get used to. Early on in my blogging life, several of my faithful followers encouraged me to show the warts and all. As in – that was really funny and you need to share that! So they shamed me into it. And it’s been so well received, I’ve kept it up. Otherwise, my life starts to look way too perfect and that does no one any good. Of course, if my husband hadn’t come up behind me and used the “treat” word, the dogs might have stayed there for a few more shots. I about did a LeRoy Jethro Gibbs smack up the back of his head for that one. Apparently perfection is boring for others to read about, even though it’s something we are all striving towards. Just sharing from personal experience. When I had a hiatus between jobs a few years back I too fell into a nice routine. The pace was so pleasant and refreshing after the insanity of the job I left. I was truly ready to return to work when a new job was found. Enjoy your special time. I so appreciate that you keep encouraging me on that. The job search – even though I’m not looking very diligently – has been all consuming. I’ve gotten so many leads and they’re panning out too! I keep thinking this will slow down, but it hasn’t. Oh how I wish I could nap in the afternoon… What a fun post. I enjoyed reading this and seeing your doggies! Thanks Debbie! They are good boys. . . most of the time. Somedays at work I get so tired in the mid-afternoon. I wish they had a nap room for a quick snooze! Thanks Mom. Yes, do stay warm. Isn’t it funny being a dog owner when everything feels like it revolves around “treats”. Treat yourself too! Great photographs! We have to be really careful about the “T” word. Then again, I keep thinking the beagle will figure out that “pantry” is the code word for treats. Then we’ll have to come up with another code word! And I do treat myself. Love my tea and chocolates. I am rolling on the floor laughing right now…I can’t believe you said the “T” word. It has gotten to the point where we have to spell things out so the dogs don’t know what we’re talking about! That cracks me up! Good to know you do treat yourself, you deserve it! Happy New Year Nancy. Structure is everything. I write from 11 till 6 Monday to Friday…treat it like a job, then give myself permission to have the weekends off. Love the pictures, you have a real gift. Thanks for the compliment and for sharing your schedule. I don’t think I could sit and write for that long! Then again, I imagine I could work up to it. Right now the job search is so time consuming, I’m not having time for my creative ventures like I’d hoped for.